Last night we ate pork tenderloin that was marinated in garlic, worchesteshire, sambal, and thyme for a couple of days. The pork was served with garlic roasted asperagus and a thyme gratin made with sweet potatoes, yukon golds, and tomatoes. The pork was accompanied by a reduction made from the marinade. T: On the surface this meal looked like something any Suzie Homemaker would prepare… pork, asperagus, taters n’ cheese… don’t be fooled. This was no average meal. A: heheheh… you mean most housewives don’t have truffle oil… did we forget to mention the truffle oil i drizzled on the gratin before baking? T: although, maybe our notions of a housewife are out of date… Whole Foods wasn’t around when we were forming our stereotypes. A: this is true.. and i did buy the truffle oil at whole foods.. although the worker looked at me as if i were nuts, then had to go find the only bottle in the store from the deep dark scary storage areas. T: wow that’s crazy… I mean, c’mon, it’s *truffle* oil. what gives? T: weak… anyway, that was some absurdly good gratin last night. I mean, on the surface this looks like it could be an ordinary meal, but it was so damn tasty. And, each item went together sooo well. Especially the gratin and the pork.. I mean, that was a match made in heaven. Damn it, it’s the year 2005 .. uhh 2006 and we still don’t have smell-o-vision or smell-o-net or whatever. I wish we could share this stuff with our readers! A: heheheh i know what you mean.. (even if we do sound like emeril, with the smell-o-vision thing) it would be great to be able to really allow people to get the full impact of a meal, not just a pic and words. T: I didn’t realize that emeril talked about smell-o-vision… well, he’s so early 2000’s… it’s smell-o-net now baby. but seriously, yeah, the pictures help a lot, but they can’t do the meals justice. A: tru dat my bwana… i do have to agree with you that each element of this meal was perfectly tied together, flavor wise. it really hit the spot for me. T: ok, so whadaya give it? T: yeah, who isn’t. I give it a 4.85/5. Each element was superb, and it all went very well together. I don’t think it’s possible to do a whole lot better with pork, asperagus, and potatoes. It was incredibly impressive. T: ok, she said it was a total “wow”. also, she said she gave it a 4.9/5, but she would have given it a 5/5 but she didn’t want to be like paula abdul. A: heheheh.. that just cracks me up, but i guess i do understand. We are secret idol watchers and it’s frustrating that paula gives everyone a really high rating all the time. T: i like paula, I can’t say much bad about her… although she is clearly.. umm… medicated. If I had half the stuff she’s got pumping through her veins I would give everybody a 150/10 too.. but I’m not dissing her… I do like her. A: Me too. and she has that dibilitating disease..poor paula. T: yes. she does. gotta love paula. hope she’s back next season. hope she’s doin’ ok next year. A: for sure. I just wanna give a quick shot out to the makers of Rogue Hazelnut Brown, it is one of the best beers out there and the people need to know about it. T: yes, we will dedicate a post to it one of these days… it’s worth it. mix all ingredients except pork and stir. Put pork into a ziploc bag and pour marinade over. Marinate for 1 hour to 2 days. 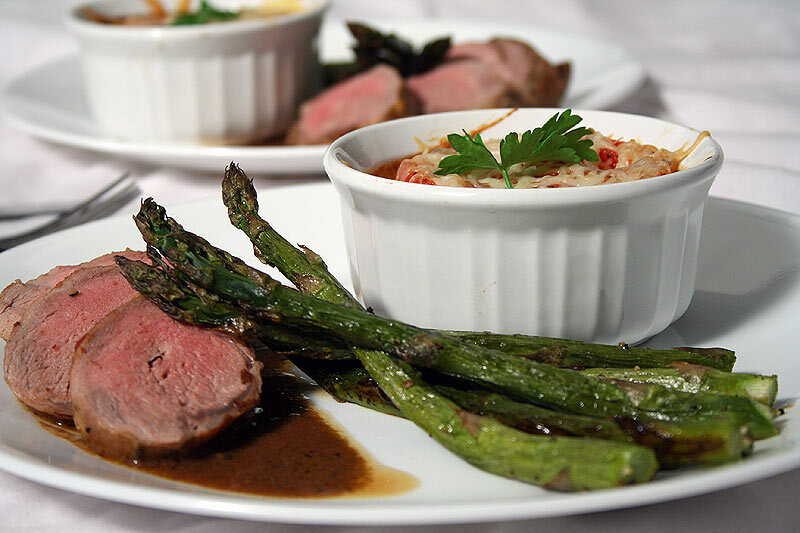 Remove pork from marinade and roast in a 400 degree oven until a meat thermometer reads between 160 and 165. The meat will continue to cook while resting. Remove the meat from the oven and wrap in foil and allow to rest for 5-10 minutes so the meat can re-absorb the juices. Slice and serve with whatever the heck you want! It's good anyway. Preheat oven to 400 degrees F. Heat a pot of water for par-boiling potatoes. Peel sweet potatoes. Cut sweet potatoes and yukon golds in to 1/4inch thick slices and let sit in a bowl of water so they don't change color. Thickly slice the tomatoes. Salt the water when it comes to a boil, then add the potatoes and cook for 5 minutes. Then drain. Meanwhile, Heat milk so it feels warm to the touch (I just use the microwave). Melt the better in a small sauce pan over low heat. When melted and bubbly add the flour and thyme. Stir and cook for 30 seconds to 1 minute. YOu do not want the roux to change colors or caramelize. Slowly drizzle in warm milk while continuously stirring. Make sure to completely incorporate each dose of milk before adding more so your sauce does not become lumpy. When all the milk has been wisked in, allow the mixture to come to a boil, then reduce heat and simmer stirring frequently. When the sauce has thickened, removed from heat and add cheese. Stir until cheese has fully melted, season to taste with salt and pepper, and set aside. 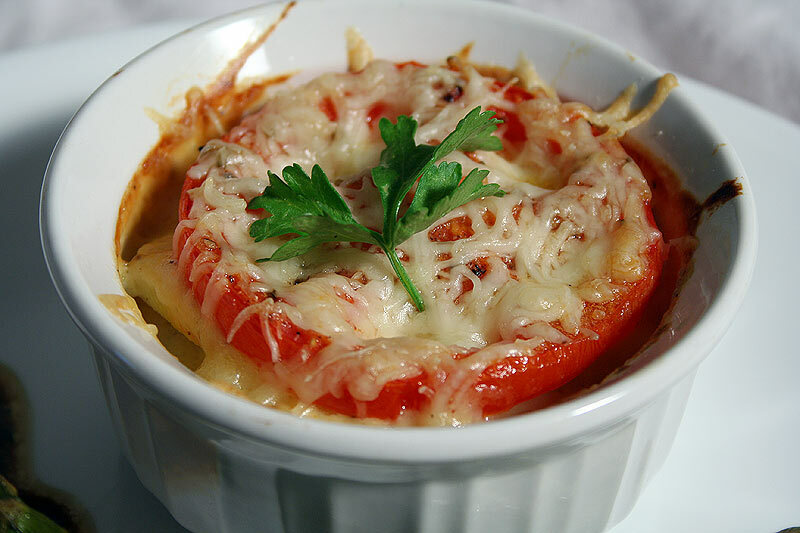 Layer cheese sauce and potatoes in ramekins or a casserole dish and place the thick tomato slices on top, drizzle with truffle oil and sprinkle with salt and pepper. Bake at 400 on the top rack for 15 minutes (or until potato is mostly roasted) then sprinkle with more cheese to create a melty gooey top layer! Once the cheese is melty and starts to brown, remove from oven. Serve hot. Boil green beans in salted water for 4-5 minutes. Drain. Meanwhile saute minced garlic paste in butter over relatively low heat. Squeeze in the juice from half of a lemon (add the zest too if you like). Cook for another minute then toss in green beans and season with salt and pepper. Cook for another 2 minutes then serve hot. Is sambal in your recipe sambal olek. Any chance you can make recipes more printer friendly. Judy, it is sambal olek… and i have been dogging t about making the recipes printer friendly for… oh…at least a year now! we’ll get there, i promise! bare with us…. but i would suggest highlighting the recipe text then copying/pasting it into a work or notepad document. you might not get the formatting but at least you wouldn’t be printing out a huge page you didn’t want! Have you ever come to OVER marinade your pork? It seems like I over marinaded pork tenderloin in a lime mix that you would use for Margarita’s? Forgive me, I don’t drink tham but all of the sweetness in the “Mix”, although lime flavored, seemedd to have left my tenderloin with NO texture. What do you think?